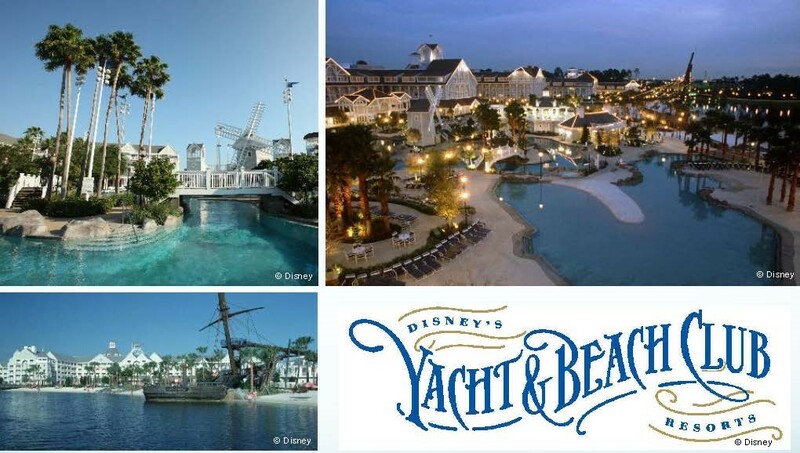 Conference attendees and their guests may stay at Disney's Yacht & Beach Club Resorts for the conference rate of $245.00 single/double occupancy per night! Extended stay at the conference rate is available between August 26, 2019, and September 4, 2019, based upon the general availability of the resort. The conference room block will remain open until July 29, 2019, or until full, whichever is earlier. Due to the early opening of Star Wars: Galaxy's Edge at Disney's Hollywood Studios (opening August 29), rooms at Disney's Yacht & Beach Club are filling quickly! Register for the conference and make your room reservation early to guarantee your spot! In the event the room block is filled or the extra nights you want to reserve are no longer available, please check one of the other Disney Resorts. The Walt Disney World Dolphin Hotel is just a short walk from Disney's Yacht & Beach Club Resorts. Discounted tickets to Disney World parks are available for attendees and their guests! Specially priced tickets can be viewed here. Free transportation is available between the Orlando International Airport and Disney’s Yacht & Beach Club Resorts via Disney’s Magical Express Transportation for all conference attendees and their guests staying at the Resort. Reservations for Disney’s Magical Express are required and can be made when making a room reservation. Room and transportation reservations and specially priced tickets are available online or by calling 407-939-4686. 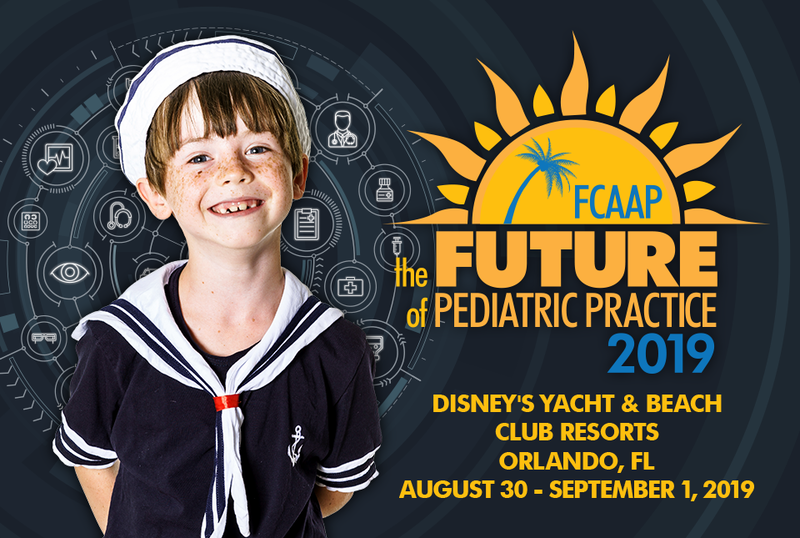 If making a reservation by phone, be sure to tell the reservation agent you are attending The Future of Pediatric Practice 2019, hosted by FCAAP, to have the conference room rate applied to your reservation. Link your conference room reservation to your MyDisneyExperience Account for easy access to your reservation details before and during your stay at the Resort. Instructions on setting up a MyDisneyExperience Account and linking your reservation to your account are detailed here. Medical students registered for the Pediatric Medical Student Research Forum must register both on this event site and on the UF website, accessible here. Through the UF website, students can select whether to have a single room or a double room with an assigned roommate. 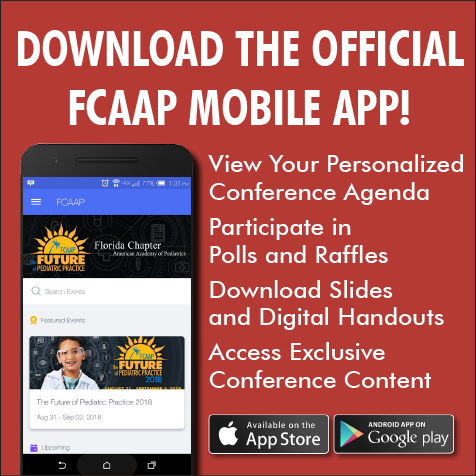 Search "FCAAP: Future of Pediatrics" in the App Store or Google Play for the free download.